I’m no stranger to sports. I mean, I usually watch more on TV than I actually participate in, but I’m still no stranger. I’ve dabbled in sports. I’m in a fantasy football league. I do go to the gym regularly. Although, that’s not really a team sport. 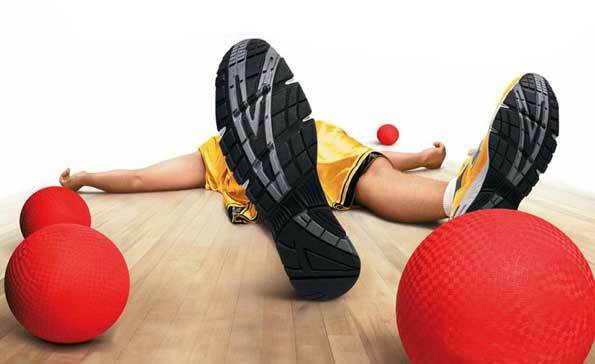 When a friend suggested we play dodgeball, I thought sure, what’s the harm? Dodgeball is no big deal. Kids play it in gym class. I was wrong. Let me paint a picture for you. You’re in an arena playing one of the most intense games of dodgeball. Dodgeballs are flying in the air at rapid speeds. Oh right, and you’re on a trampoline, actually, many trampolines all attached to make a sort of super trampoline. I know what you’re thinking. How could playing dodgeball on a trampoline be anything but safe? You’re finally getting the hang of it and BAM!!!! A dodgeball comes out of nowhere and smacks you so hard in the eye that you go down. Someone has to help you off the trampolines because you can’t see out of you’re right eye anymore. Actually, you’re not sure, but you can’t open it, which is basically the same thing. You’re eye’s all red and the right side of your face is starting to swell. Luckily, the employees are quite used to this and fetch you a bag of ice. But don’t worry, there’s free pizza. So it all works out in the end. And five days later, you can finally open and close your right eye again, virtually pain-free.